Because of the travel and time demands of our jobs, my husband and I decided to wait until we retired to get a puppy. We were fortunate to have both retired within a year of each other and began "the hunt" for the perfect pooch, when we came across "Toby". I fell in love with him online...and once he was placed in my arms by his breeder, you couldn't pry him away with a crowbar! The long wait for the perfect puppy was well worth it. Toby is a shy little boy, but very much a "big dog" in a small dog's body. And, adding him to our family has allowed us to "fast-track" some of our long-term home and technology updating plans! For example, we replaced our cell phone with an upgraded version, after Toby mistook the previous one as a chew toy. And, we replaced the Berber carpeting in our living room with hardwood flooring, when Toby discovered how much fun a red pen could be! Comments for "Red pens aren't toys????" How did u do posting ur picture. I kept going in voting for u when I got the chance. Have u posted again for April. Well I have gone to Petcentric 3 days now & voted. Thou when the big picture comes up I cannot see the word to descramble. It seems to be working thou since now u rank 13 & Sun. it was 16. One thing nice about purina petcentric is that u can download ur pets photo & make them talk words to send friends u know b-day, get well etc cards. The cards are their to use free. The only thing I ever get from them is the monthly newsletter & no junk mail do they send. I will go there Sat. 2/17/2012 St. Patty's Day & vote. Well, Vicky and Jonah (AZ), I took your advice and entered this picture of Toby in the Purina Photo Contest! If anyone would like for vote for him, the title of his photo is "Red pens aren't toys???" by halnkathy. 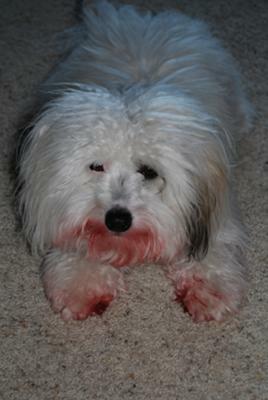 Well now u have a designer dog that u do not need pay someone to dye with food coloring. Thanks for sharing the picture it brought a smile to my face & reminded me of some funny memories. I did enjoy this photo of Toby. Then all I could think of is what a nightmare it was to get all of that red ink out of his hair. The only thing that I could think of doing is cutting his hair. I know how much time that I put into Sandy (my Cotton) hair. I know how much I would hate to cut her coat. My cotton just turn one at the first of the year. They are the best dogs around and I can see you do enjoy Toby. How can you not love a dog like that. Thanks for sharing your adorable Toby with us. put some holly around his neck and you have a Christmas card...........so cute.